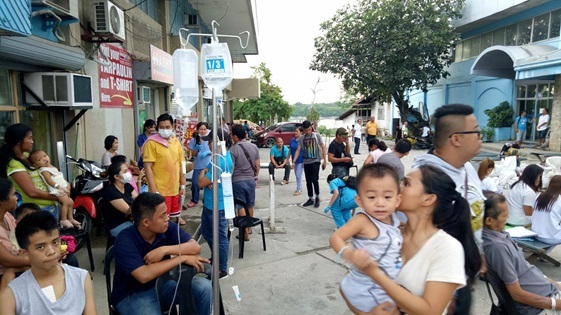 Over 30 patients of the Borja Family Hospital were evacuated at around 3 p.m. yesterday to a nearby open space outside the Marbella Leisure Plaza after the bomb threat was reported to police. The still unidentified male suspect who caused panic and prompted the evacuation of patients and personnel of the Borja Family Hospital by reporting a bomb threat through a phone call on Wednesday likely called from within Bohol. Tagbilaran City police chief Supt. Patricio Degay told DYRD Balita that the conversation between the Filipino-speaking suspect and the hospital’s receptionist who the police official only identified as Lilia was loud and clear. According to Degay, the police will be coordinating with the National Telecommunications Commission (NTC) in an effort to trace where the call was made by the male suspect who reported the bomb threat which turned out to be a hoax. “Mag-request tayo sa NTC dahil landline kasi tumawag para alamin kung pwede ba natin ma-trace at kung paano yung technical aspect doon,” he said. Earlier, police have also requested the Borja Family Hospital administration for access to the facility’s closed-circuit television footages to review whether suspicious-looking individuals have entered the building around the time of the call. Authorities have yet to identify the motive of the suspect who caused city-wide panic and the closing of a busy segment of Gallares Street in front of Borja hospital which was filled with United States-based doctors who were carrying out a surgical mission for patients with cleft lip and palate when the evacuation was ordered. Over 30 patients were evacuated at around 3 p.m. yesterday to a nearby open space outside the Marbella Leisure Plaza, and were allowed to reenter the hospital at past 5 p.m. after clearing operations were conducted by police with bomb-sniffing dogs.